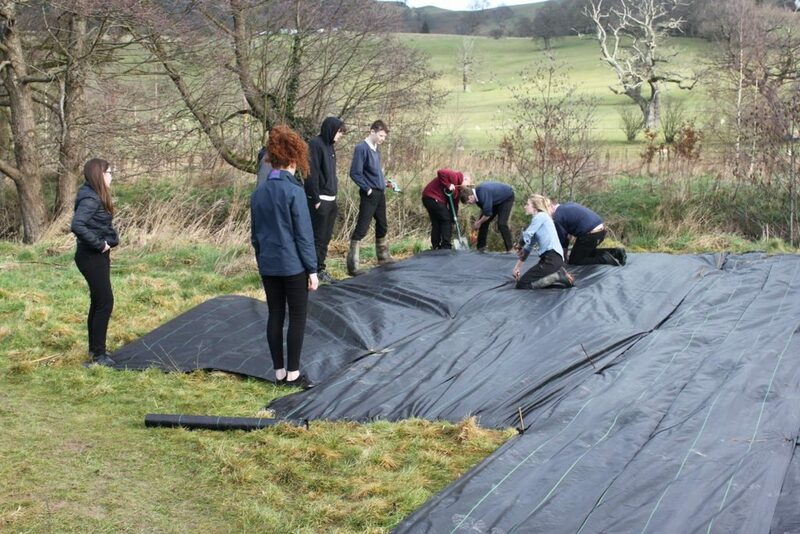 We have had a very proactive day again in the field with Mr Emyr Jones and students from Llanfyllin High School with spring in the air and energies high as half term term is fast approaching, the students did a fantastic job at laying the weed matting as preparation for the community willow project. The principle aim of the willow project is to generate an annual income for Cae Bodfach. Willow provides habitat in the form of food and shelter for wildlife, as one of the first species to flower in early spring late winter and this is crucial for our early pollinators as they wake their hungry sleepy heads after a long winter and the stools of willow coppice provide safe habitat for overwintering invertebrates. Willow coppice is a sustainable management technique where the shoots are cut down to 30cm above the soil level with the main stem being left in place. The cutting (known as coppicing) encourages fresh growth the following year. Coppiced plants are known to live many times longer than non coppiced plants. The straight young stems (known as rods or maidens) can be graded and sold for biomass or traditional willow crafts such as basket making or willow structures. Coppiced rods are also used to grow new plants, so once we have this specially selected variety it will be possible to use it to propagate more plants from this first initial planting. Also any surplus can be made into biochar for use in soil amelioration. Keeping these management practices and crafts alive, retains a strong link to British cultural history and looks forward to a regenerative future. The idea of this project is to generate an annual income for the Cae Bodfach Community field. 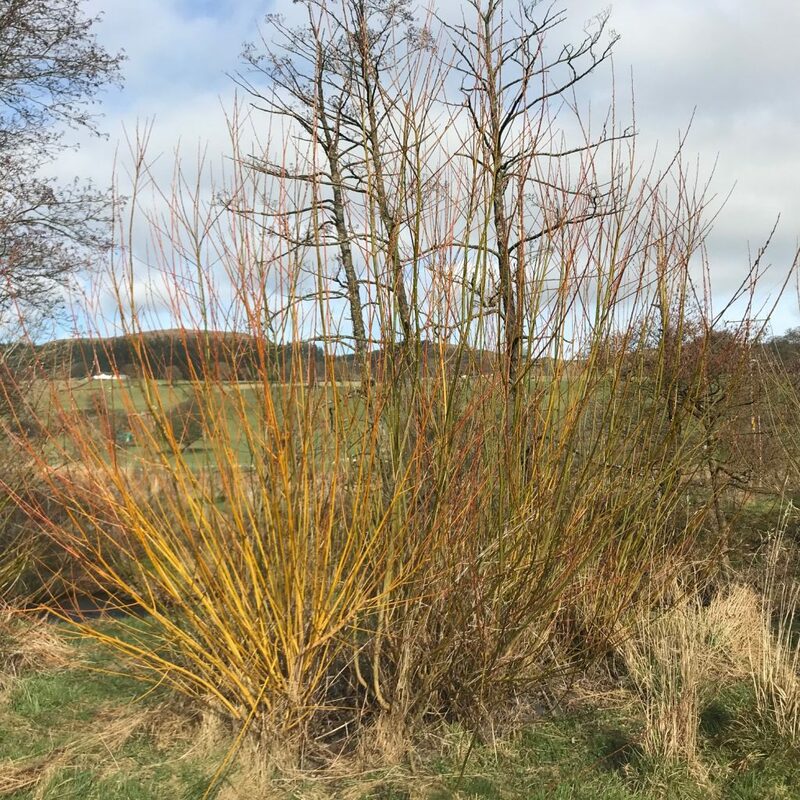 Working alongside a willow professional, Steve Pickup of Willowbank.com, we have specifically chosen to plant this species of willow due to its rapid growth, it can grown up to 5m a year. Cae bodfach has the space to grow a 100msq of willow, whilst the willow is growing it will provide all of the services listed above, then in a couple of years, Steve will buy the willow back from the field for a sum of money which will go into the Cae Bodfach community fund. Win Win Win. We are mimicking natural systems by planting our willow into mypex. As willow is a pioneering plant, it has a small lightweight seed which will be blown by the wind onto bare soils and there it will quickly colonise and begin to stabilize and rejuvenate the soils. That’s one of the ecological functions of willow. Yes but.. Isn’t that plastic? Questions are often raised about using mypex, and its a fair one as it is a plastic. However, mypex is a polypropylene, unlike other plastic (used for carrier or animal food bags for example) polypropylene does not degrade and breakdown in the same way as other plastics would. It is made for purpose, and used correctly it does its job well. 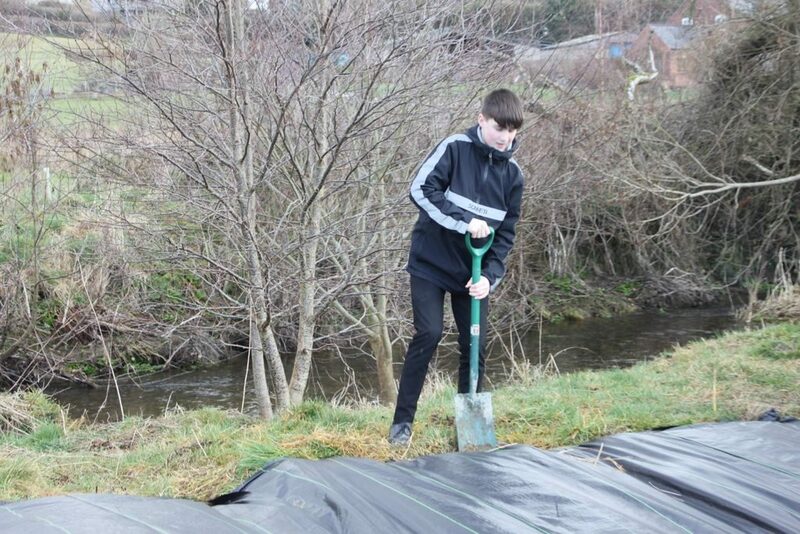 It is woven for maximum permeability to allow water and air to get to the soil, it completely excludes the light, therefore suppressing the grasses beneath it, which eventually die and are incorporated into the soil by soil microorganisms to become nutrients for the willow plant above. 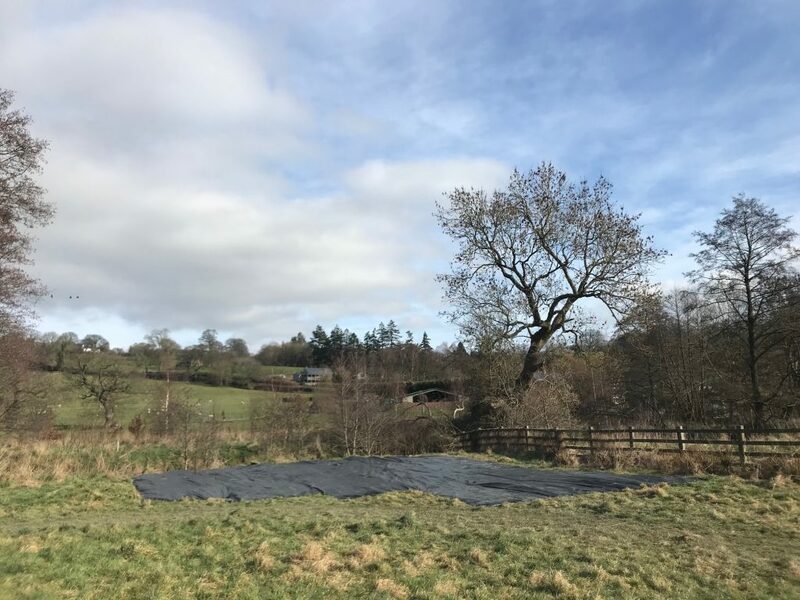 Importantly, once the plant is growing sufficiently to hold its own against the grasses, the mypex can then be carefully removed and even reused in other projects. If the willow is spaced correctly you can then use a lawn mower to continue to keep the grasses down. 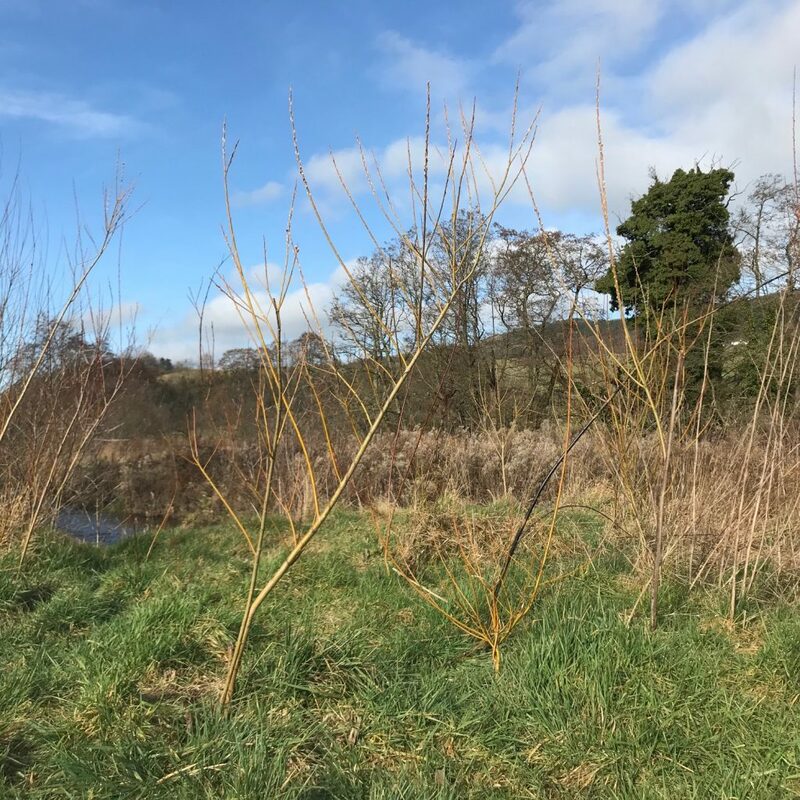 Dewi Morris from the wildlife trust planted a willow experiment at cae bodfach which demonstrates very well the difference between planting with mypex and without mypex. The willow with the mypex has grown substantially better than the one without. In permaculture principle 9 is; ‘Use slow and small solutions’. This principle reminds us that systems should be designed to function at the smallest scale that is practical and energy efficient. So similarly to Dewi Morris’ mypex willow experiment, we have planted this corner edge as a test site to showcase the idea, and see if it works for the field. By coming in from the edges, next to a degrading section of riverbank, not taking up too much space and only planting a small crop, enables us to try out ideas before committing too heavily whilst still obtaining multiple yields from it.